Visitors to Manchester Art Gallery can expect to see a wealth of outstanding works on display from the collection, as well as an ambitious programme of temporary exhibitions showcasing art and culture from around the globe. The programme here at MAG is at the forefront of what we do, but there is also a huge amount of work that goes on behind the scenes to bring artworks from the collection to wider audiences across the UK and internationally. I began working at MAG in 2008 and in 2015 I took up the role of Loans Manager. I’m based in the Collections Management team but primarily my job is to manage the assessment and admin of loans from the collection to other museums and galleries in the UK and around the world. Each year we receive a large number of requests to borrow works. So far in 2017 we’ve had a total of 138 works requested for exhibitions and displays at 58 venues. While we can’t support every loan, we do agree to lend the majority of works that are requested. Our loans programme is key to raising the profile of the MAG collection both nationally and internationally, enables us to increase our own knowledge and understanding of the artworks and to develop important partnerships with other organisations. The loans programme requires support from various different teams at the gallery and I work closely with our conservators, curators and art technicians to make these happen. 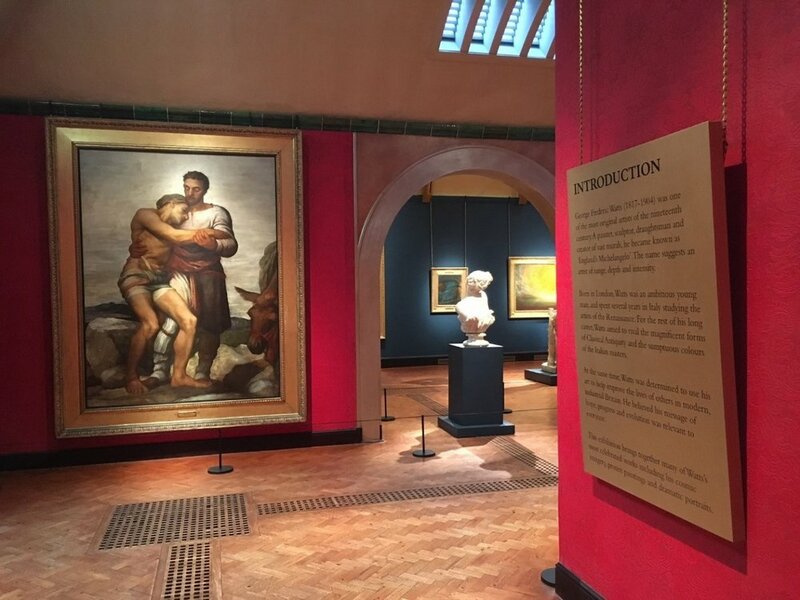 If works for loan are on show in our own galleries then a suitable replacement needs to be identified, prepared for display and then installed. This can be a particular challenge when it comes to some of the larger works in our collection and it takes a real team effort to make sure everything runs smoothly! 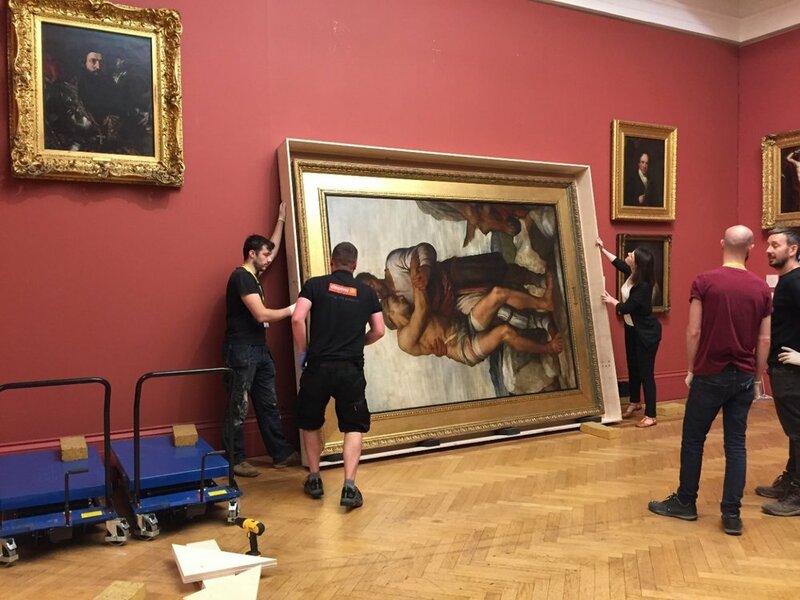 The Good Samaritan by George Frederick Watts (1882.149) – one of our largest paintings at 3m x 2.5m – being taken down and packed in preparation for loan to the Watts Gallery in Guilford in 2017. Many of our artworks are extremely well travelled and this is testament to the quality and appeal of the works acquired for the collection over the years. Our Gauguin Harbour Scene, Dieppe is one of our most frequently requested paintings and in recent years has been out on loan to galleries in Japan, France, South Korea, Taiwan, Panama and Denmark. As well as managing our busy loans out programme, I also work on incoming loans to some of our temporary exhibitions and longer term displays. By the time an exhibition has opened I’ve probably spent around 6-12 months working on the loans, establishing the specific requirements for each of the works we are borrowing and reassuring lenders that we will take the best possible care of their artworks. I liaise with specialist transport agents to arrange the packing and shipment of works, make sure the correct insurance is in place and ensure loans contracts are prepared and signed. The amount of work involved in loans for temporary exhibitions can vary hugely from show to show depending on the number and type of artworks involved. In recent years we have staged several large scale exhibitions, borrowing works that have pushed the limits of the building in terms of size and weight, and testing the nerves of our install team who are tasked with getting the works safely on and off display! Seeing the artworks unpacked and installed at the gallery after many months of hard work is a real highlight of the job. It’s wonderful to be able to see the works up close before the exhibitions open to the public and to know the story behind each individual object. I’m currently working on loans to a few of our exhibitions opening next year. Annie Swynnerton Painting Light and Hope includes works from various public and private collections in the UK and our Scandinavian Design show looks set to include works from lenders in Finland, Norway and Denmark. We also have some significant works from the collection going out over the next 12 months. Our Paul Nash painting Nocturnal Landscape will be part of a large Nash retrospective at the Fondation Vincent Van Gogh in Arles, France opening in April. Later in the year our John Singer Sargent painting Albanian Olive Gatherers will be travelling to Nationalmuseum Stockholm for the first major display of the artist’s work to be held in Scandinavia. I will be posting a run-down of all of our loans out on the Manchester Art Gallery blog every few months so if you would like to see where our works are travelling to keep an eye out for updates!